The Diabetes Network for Northern Ireland has received £2.6m funding to improve the lives of those living with diabetes and those at risk of developing diabetes. Diabetes affects over 90,000 people here. By 2027, around 45,000 more people will be living with Type 2 diabetes in Northern Ireland. 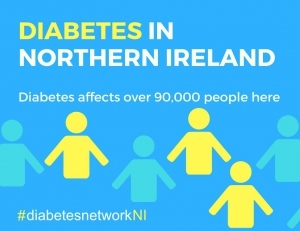 The Network, which comprises people living with diabetes, clinicians and healthcare workers across all Health and Social Care organisations and Diabetes UK (NI), works to improve the standard of care and services available within Northern Ireland. Welcoming the funding announcement, Valerie Watts, Chief Executive of the Health and Social Care Board and Interim Chief Executive of the Public Health Agency, said: “I am delighted to announce that the Diabetes Network for NI has received £2.6M funding to improve care programmes for people with diabetes through innovative new schemes in 2018/19. One of the key initiatives planned this year is a new care pathway for foot disease across all five Trusts. Problems with foot care are some of the main contributors to amputation and disability for people living with Type 1 and Type 2 diabetes. The Public Health Agency is also contributing to work to help prevent diabetes for the estimated 25,000 people in NI who are currently at risk of developing Type 2 diabetes. They are providing support through obesity prevention programmes, such as Weight to a Healthy Pregnancy, Active Schools Travel, Food in Schools programme, and the development of a regional diabetes prevention programme. In addition to the funding announcement, the Network is delighted to have helped to recently introduce Flash Glucose Monitoring free on prescription here in Northern Ireland – a blood glucose monitoring device for children and adults living with Type 1 diabetes. This technology makes living with diabetes easier because it makes testing simple by reducing the time taken to check blood sugar from minutes to seconds and without the need for frequent finger pricks. Jillian Patchett, National Director of Diabetes UK (NI), said, “It is welcome news that the Diabetes Network will receive further funding to help deliver what was outlined in the Diabetes Strategic Framework. Delivery is key and it needs to happen quickly and efficiently. Further information about the Diabetes Network for Northern Ireland.